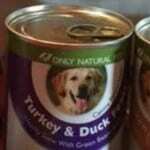 This post is sponsored by Natural Balance, and the BlogPaws Professional Pet Blogger Network. 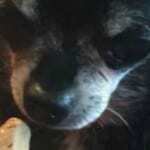 I am being compensated for helping spread the word the word about Natural Balance Wild Pursuit TM or Natural Balance Treats, but I Love My Chi only shares information we feel is relevant to our readers. Natural Balance is not responsible for the content of this article. One of the problems I have with having 2 big dogs and a little dog is that family members will give all 3 dogs the same treats. Big dogs can have bigger treats with no weight issues as long as they are fairly active and are not getting too many. The problem I have is that family members (not me of course, well maybe occasionally me) are giving Kilo those same treats. Hence her weight gain. 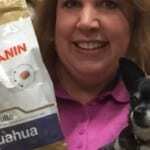 So I was excited to get the opportunity to try out some healthy treats from Natural Balance® Pet Foods. 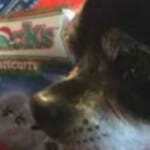 We got 4 varieties with several of them perfect for small dogs like Chihuahuas. I can highly recommend the Mini-Rewards. They are tiny and Kilo loves them. The other varieties were Burger Bites, Dental Chews and Belly Bites. Buddy, Roxy and Kilo taste tested all 4 varieties. They gobbled them down and begged for more so the treats passed the taste test. 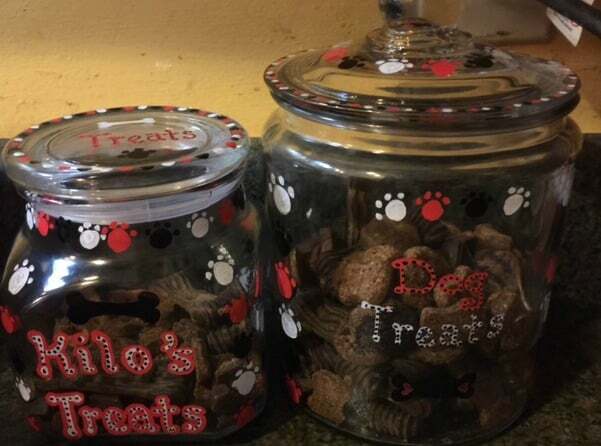 Now that I found some Kilo-sized treats for her, the next thing to do was to make separate treat jars for the dogs. I bought 2 jars and 3 paint markers from the craft store. Be sure to get the markers that work on glass. I used the Sharpie oil based markers. Now all you need to do is doodle! Let me give you a few tips on that. If you want to write words such as your dog’s name or simply “dog treats”, just make block letters and put dots on the ends of the letters. Everything looks cute with dots. You can even take it a step further and put dots in the letters like I did. If you make a mistake, just wipe it off with a little nail polish remover on a paper towel and start over. You don’t need to be an artist. You can make an adorable jar just by doing dots and circles. There are loads of dots on these jars. 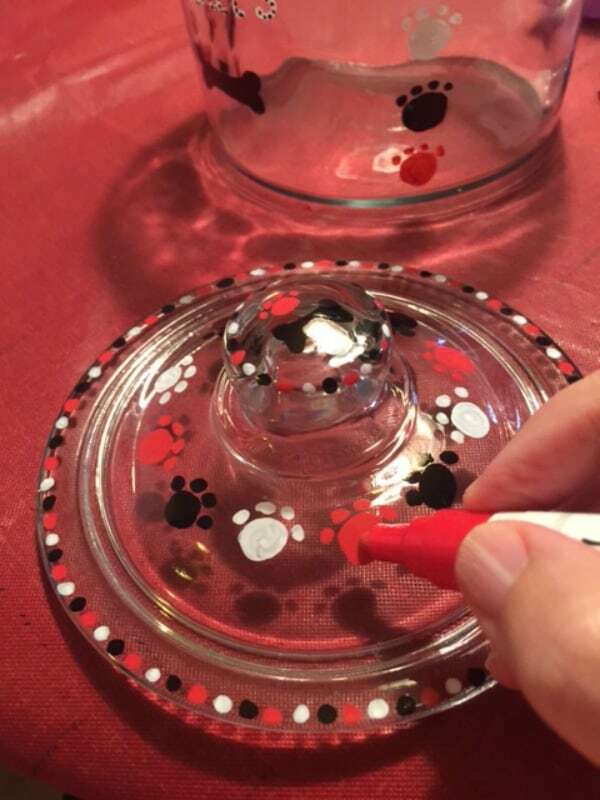 The paw prints are just a big dot with 4 smaller dots. Even the bones are just 2 dots put together on each side with lines connecting them and then filled in. Easy-peasy. After the jars dried, it was time to fill them! The jar on the left has treats for my big pups. 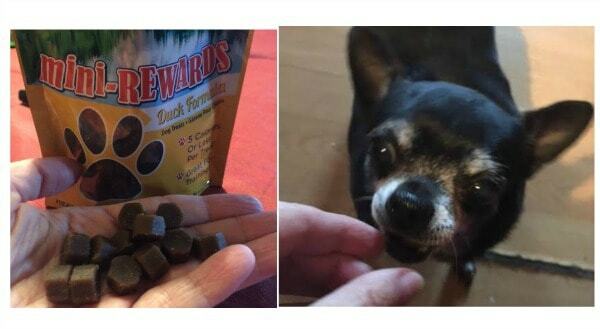 The one on the right has the treats for Kilo. 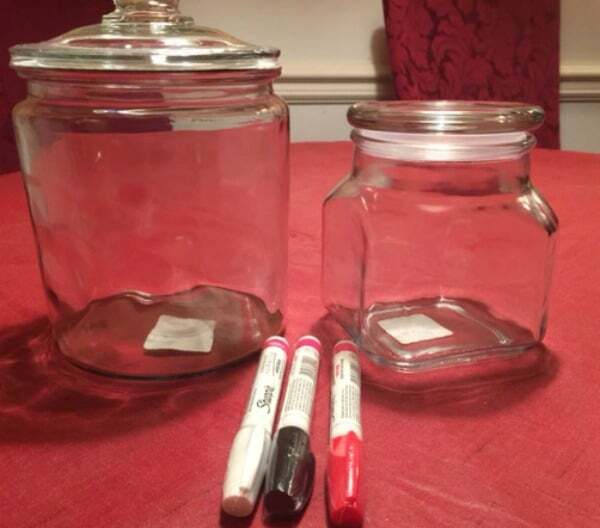 Here are the jars sitting on the counter. What do you think? Aren’t they cute? 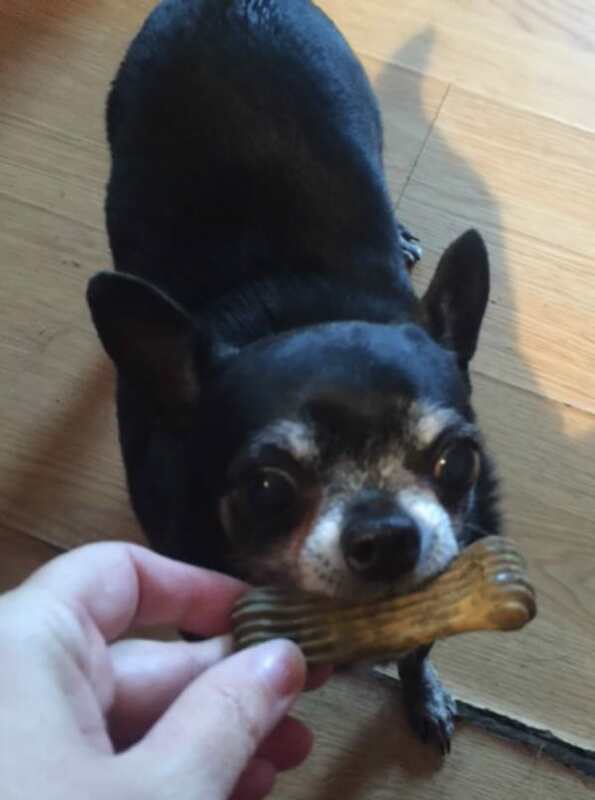 After Kilo’s “photo shoot” I rewarded her for being such a good girl with a Dental Chew from Natural Balance. She loved it. In fact all the dogs loved all the treats. They were definitely a hit. And I feel good knowing they are getting healthy snacks with no ingredients or colors. 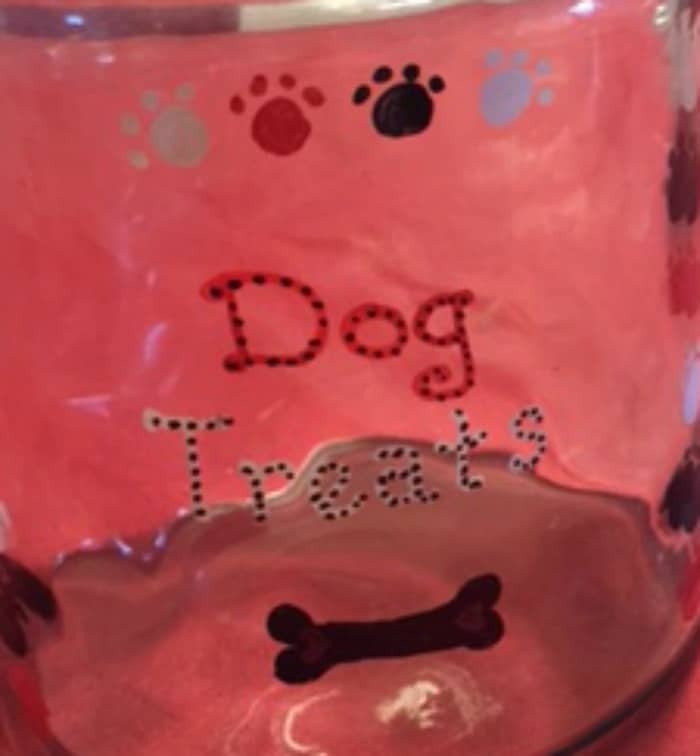 Let me know if you have any questions on making your own dog treats jar. And please post a photo below if you end up making your own. I’d love to see it. I want to make that jar for gifts for dog friends for the holidays. Thanks for the inspiration and I plan to get those dental chews from Natural Balance to stuff into them. Cute doggie! Great post, Cathy! I love your treat jars, they’re so cute. 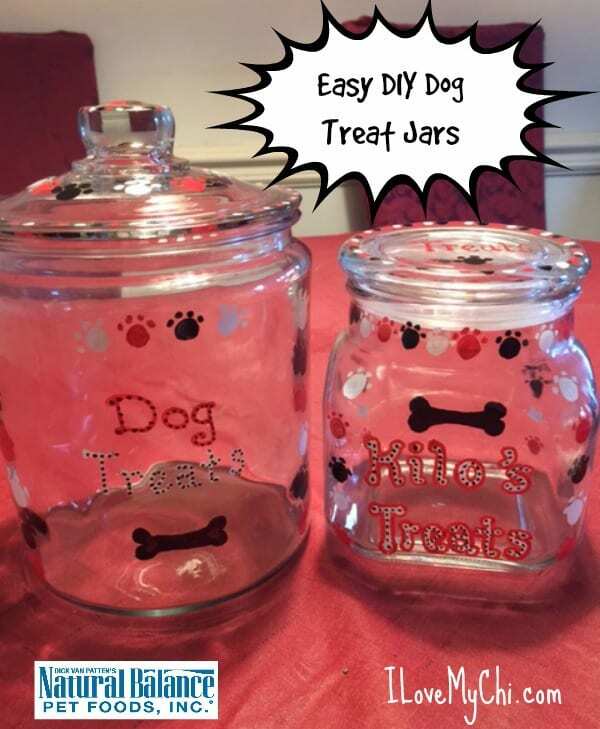 I like that you created separate jars for your big and little dogs, that a great idea. 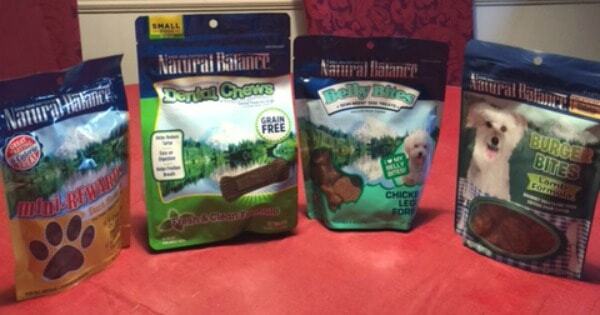 My dogs love Natural Balance treats, we buy all different kinds! 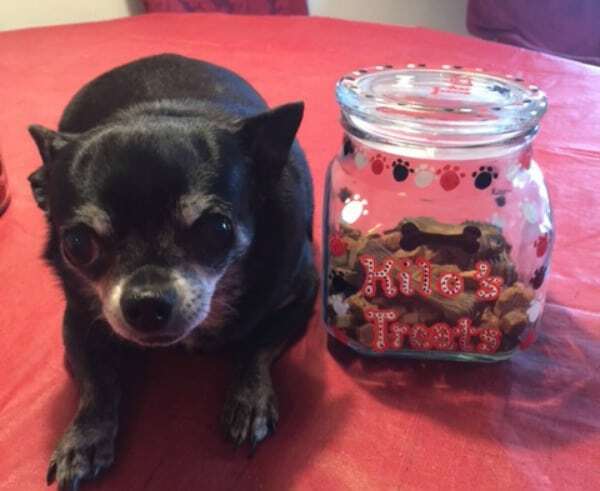 Those treat jars are adorable, and love that the little Kilo has her very own jar with smaller treats:-) and love Natural balance treats, too! Thanks Joan! So glad you like the jars.